Can We Really Attract Good Luck By Buying Certain Products? Now, the lady in the show is not the only one advocating that we have to buy certain type of money bags, place fountains, grow certain type of flowers, keep some lucky stuff in the room- this type of hype started years ago but another Feng Shui consultant. The consultant even started an entire business spinoff selling stuff that she promote will bring good luck. 1. A client of hers complained that she was not getting along well with her husband. So the lady in the talk show went over to check out the house. In the bedroom, clothes were thrown all over the place- the bed actually looked like a garbage dump and when the couple wanted to sleep, they just shove the clothes aside. The house was untidy. No wonder the husband does not feel like coming home. So, when the wife cleaned up and made the place tidy, her husband also was more loving and receptive. 2. Another client of hers is a restaurant owner who is suffering in terms of business. There are only a few tables with customers- most tables are empty. So the lady taught her client to have huge mirrors (probably to replace the hall). Now, mirrors can give the multiplying effect- so potential clients who walk past outside will tend to get the impression that they are more people dining. And true enough, the business improved after the mirrors were placed. 3. There should not be any bad smell in the bedroom. Bedroom should always be kept tidy and neat. Imagine if your potential bf/gf comes and see that your room is a mess- he/she would think twice before wanting to marry you, rite? 4. There should not be bad smell in the kitchen as well as if there are constantly bad smell due to rubbish not being thrown away, dishes not being done, kitchen not being cleaned, etc, the health of the family may suffer. We should always try to make the environment pleasing, nice and as clutter free as possible. This will relax our mind and when we go home everyday to a warm and relaxing home, our stress levels will decrease and we will feel happy. In the long run, it brings health and improvement. 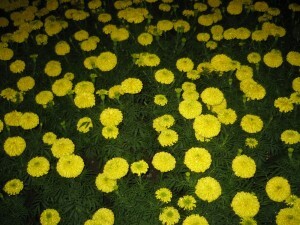 Yellow flowers supposedly bring in good luck. If the colour brightens up our day, why not? But to say that by putting a pair of Mandarin ducks by the bed and the person will find Mr/Ms Right, etc, it does not really sound logical. Or to color the hair brown just because that year happened to be the year of the Earth element does not make much sense. If that is the case, do we need to dye our hair blue on Water element year, red on Fire year and Metallic/Silver/Gold on Metal year? — this was not mentioned by the lady in the show but it was mentioned by a once famous Feng Shui consultant. This few months have been a pressing time for many people- and in difficult times like this, my concern is that there will be so called “experts” who will try to prey on people’s guillibility and fears. This will make a lot of people start spending the very little money they have to buy “auspicious” items that is supposedly bring in good luck. And “auspicious” items are normally ridiculously highly priced. I have seen so many people following these rules and guidelines to the “T”. But there are no gurantees in life- 2 of these people eventually lost their lives to cancer, another is rich but their kids broke the heart, some have conflict in the family. Still, certain Feng Shui Masters like Joey Yap will tend to make more sense because it is based on a lot of calculations, and not so much as placement of items or buying some objects. The best protection in this world is to make ourselves be good as we possibly can, live with a clear conscience, do no harm, stay positive and yes, meditation and prayers. If we have bad character traits, we try to eliminate them. We appreciate our loved ones and don’t take them for granted. We realise we cannot change the world, but we can change ourselves. Don’t think bad or do bad to others because whatever ‘goes around, comes around’. And yes, declutter and organise our lives, let go of emotional baggage. Having a clean, simple and bright home will often lift our energies levels- a dark, dusty, dirty and untidy place would tend to give bad vibes. Why is everyone busy being busy? Spare the rod and ruin the child?